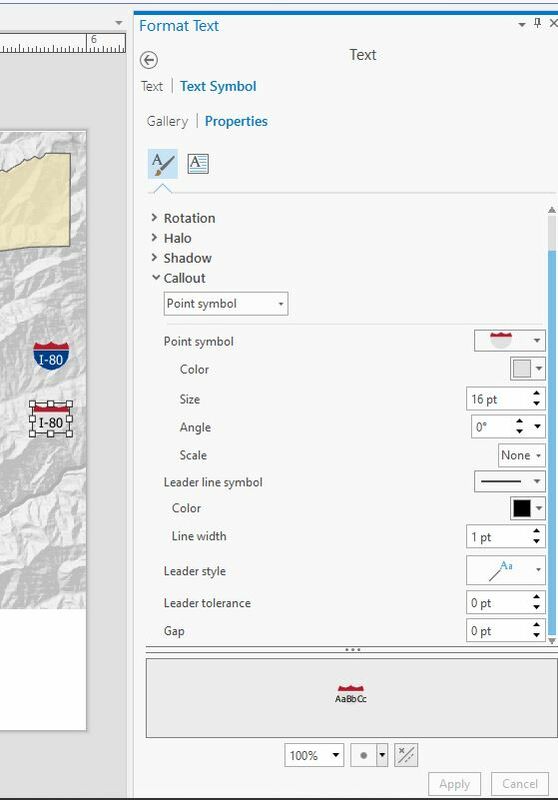 I would like to know how to change the color of the top of an interstate shield text symbol in ArcGIS Pro. The default interstate shield symbol is a blue shield with a red top. In the text symbol properties, it is easy to change the bottom of the shield from blue to another color (see screenshot). How can I change the top of the shield? I am able to do this in ArcMap but can't identify how to do it in ArcGIS Pro (2.1.0). I want interstates labeled, but want the labels to be more muted, so I am trying to make them gray instead of colored. There's not a way to get there from here, unfortunately. Pro's UI tries to avoid the "recursive dialogs" that you had in ArcMap, since it makes it pretty easy to get lost in a sea of dialogs with OK/Cancel buttons. However this is one case where it could definitely be frustrating. To change both colors on the symbol, you'll have to separately copy the shield symbol into another style (one that's not a system style), edit it to change both colors, and then you can use that edited shield symbol in your label class as the marker symbol. Not the answer you're looking for? Browse other questions tagged labeling symbology arcgis-pro text or ask your own question. Annotation label symbols: How to manipulate the size of the symbols themselves?